Understanding the HP 8407A Network Analyser is my first attempt at using network analysis. Most of my test equipment is fairly easy to use and I have had previous experience with similar items and their applications. Network Analysers are one (of the many) areas where I have little knowledge, although I appreciate their general function, so these are my working notes. The Network Analyser System has now all been tested. 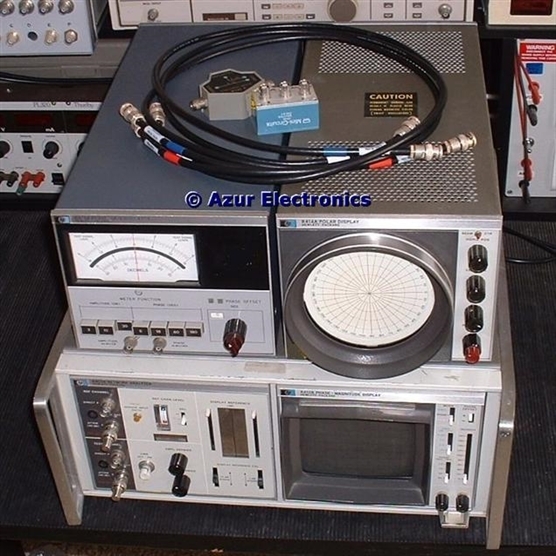 This comprises the HP 8407A Network Analyser, HP 8412B Phase - Magnitude Display, HP 8413A Phase - Gain Indicator, HP 8414A Polar Display, Matched BNC Cables, Mini-Circuits Power Splitter (in place of HP 11652-60009 Power Splitter) and HP 8721A Directional Bridge. 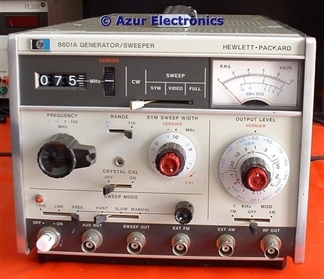 In addition the System requires the HP 8601A Generator Sweeper to provide the signal source and a RF Output + 200MHz VTO (Voltage Tuned Oscillator) signal which phase-locks the System. All this equipment has taken me 4 years to acquire, repair and test! Now to try and understand its use and applications. 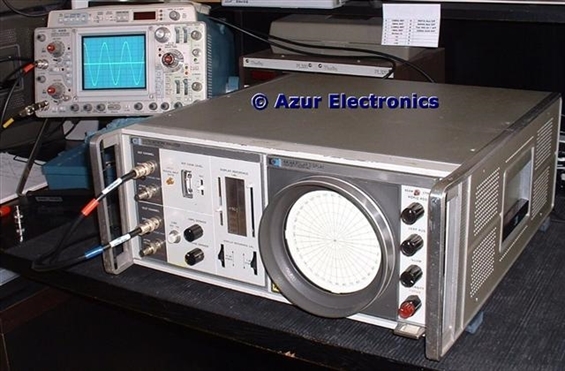 As well as HP's excellent Operating & Service Manuals for the individual items of equipment, very useful reference sources are HP Application Notes 121-1 "Network Analysis With The HP 8407A 0.1 - 110 MHz", 121-2 "Swept Impedance With The 8407A Network Analyzer 0.1 - 110 MHz" and HP Journal December 1969 "Network Analysis in the Range 100kHz to 110MHz". Essential reading! These really highlight the benefits of using the 8407A when compared with Crystal Detectors and RF Voltmeters. 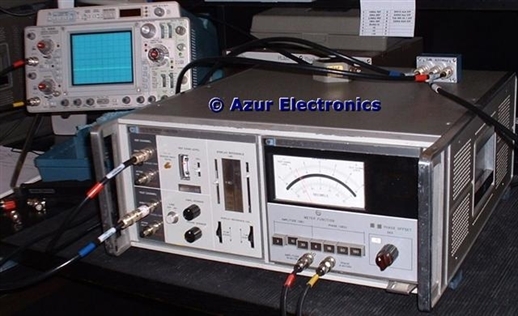 The 8407A Network Analyser is comparing one signal (REF) against another signal (TEST), both derived from the same phase-locked source via a power splitter, then measuring the difference in amplitude in dB and the difference in phase in degrees. With this System a frequency range of 100kHz to 110MHz is available, either CW or Sweep, and from +20dBm to -90dBm input levels. Standard inputs are 50Ω although various high impedance probes were available. The 8407A inputs are attenuated by either 10dB DIRECT or by 50dB ATTEN, this gives an actual input signal range of either -10dBm to -90dBm DIRECT or +20dBm to -50dBm ATTEN. The Damage level is >+26dBm or 50Vdc. These RF inputs are converted to 278kHz IF signals, phase-locked to the signal source, while retaining their amplitude and phase information. 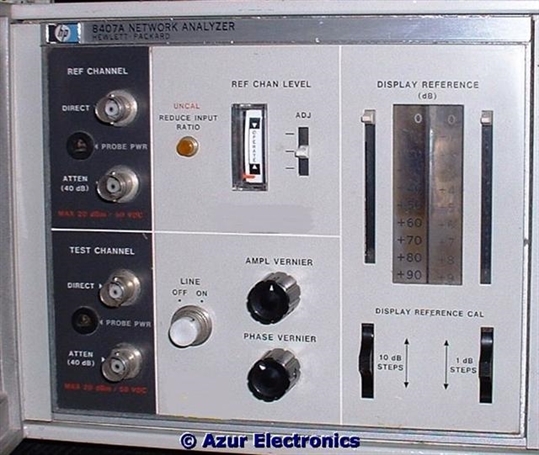 The REF channel has a ±20dB attenuator REF CHAN LEVEL ADJ to optimize operating levels as displayed on the meter, this also affects the TEST channel. The PHASE VERNIER provides 50° variation to the IF REF output. 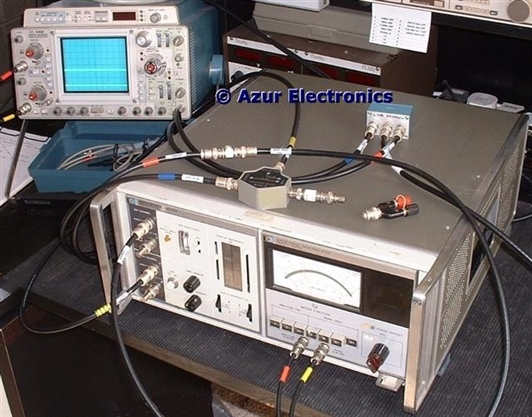 The TEST channel has a 10dB and 1db step attenuator to provide up to 89dB of amplitude offset for convenience in setting amplitude reference levels and making amplitude measurements. The AMPL VERNIER works through the 1dB step attenuator for fine adjustments of the amplitude trace on the Diplay units. 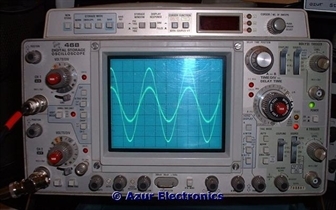 The 8407A Rear Panel IF REF output and IF TEST outputs at 278kHz on the the Oscilloscope. This shows the IF is phase-locked to the 8601A. IF REF is typically 1.3Vpp and IF TEST will vary with attenuator settings. The effect of the PHASE VERNIER can also be clearly seen. The 8407A sends 3 outputs to the Display Unit: IF Ref, IF Test Amplitude and IF Test Phase. 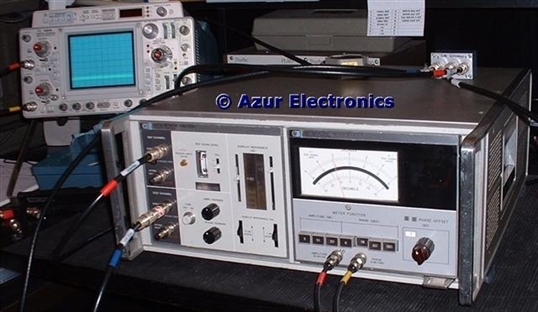 The Operating and Service Manual for the 8413A Phase Gain Indicator explains how to make: single frequency transmission measurements; single frequency reflection measurements; swept frequency transmission measurements; and swept frequency reflection measurements. The 8413A is fine for single frequency measurements, or swept frequency measurements with a slow sweep speed. 1. Connect REF & TEST Channels to Power Splitter. 2. Use appropriate DIRECT or ATTN inputs, depending on input level. 3. Terminate other unused inputs. 4. Check REF CHAN LEVEL is in OPERATE window, adjust RF output from Generator if necessary, or use ADJ (normally in centre position) with ±20dB steps if necessary. 5. Use DISPLAY REF and AMPL VERNIER to zero Meter with 3dB range selected. 6. 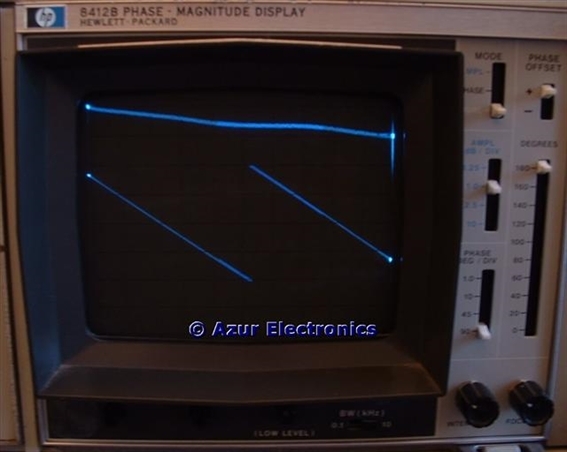 Connect Oscilloscope to AMPLITUDE 50mV/dB output and check 0mV output. 7. Connect Device Under Test (DUT) to TEST Channel. 8. Read out AMPLITUDE dB on Meter for gain or loss, eg. -20dB on 30dB range. 9. 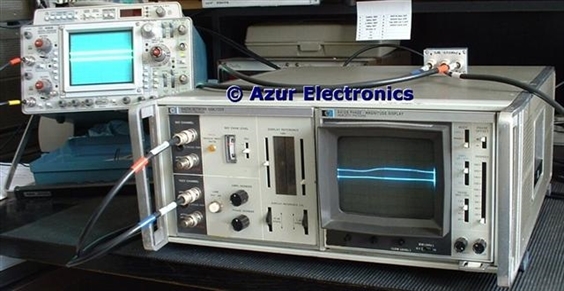 Confirm reading on Oscilloscope, eg. -1V. In this case a 6dB attenuator is connected to the TEST channel. The Meter indicates -6dB and the Oscilloscope shows -300mV. This is over a full-sweep bandwidth of 110MHz. If the gain or loss is >30dB, then adjust the DISPLAY REFERENCE attenuator to bring the Meter closer to zero. The algebraic result of the Meter and attenuator provides the gain or loss. 1. Set up for Amplitude Measurement as above. 2. Set PHASE OFFSET switch to zero. 3. Select 180° Phase range. 4. Adjust PHASE VERNIER to zero Meter. 5. Select 60°, then 18°, then 6° Phase range, adjusting PHASE VERNIER if required to zero Meter. 6. Connect Oscilloscope to PHASE 10mV/DEG output and check 0mV output. 8. Read out PHASE DEGREES on Meter for phase shift, eg. -24° on 60° range. 9. Confirm reading on Oscilloscope, eg. -240mV. The Meter indicates -6.5° and the Oscilloscope shows -65mV. non-linearly over the 100kHz to 110MHz frequency range. When measuring large phase angles near 180° it is best to use the PHASE OFFSET control to bring the Meter reading closer to zero to avoid instability. The algebraic result of the Meter and control provides the phase angle. 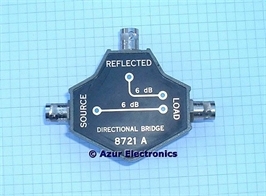 These are measured in the same way except that the 8721A Directional Bridge is inserted in the TEST output of the Power Splitter. SOURCE to Power Splitter, LOAD to DUT, and REFLECTED to TEST CHANNEL of 8407A. Note that the cable lengths in the REF and TEST channels must be matched and that there is 6dB insertion loss between SOURCE to LOAD and also between LOAD to REFLECTED. Calibration is achieved with a BNC Short connected to the LOAD. This is replaced with the DUT for reflection measurements. The output of the DUT must be terminated in 50Ω. See the Operating & Service Manual for the HP 11652A Transmission/Reflection Kit for more information. Fast swept measurements are difficult to display correlated against frequency, even using the Generator Sweep Output to the Oscilloscope x-axis. This is where the 8412B Phase Magnitude Display comes in. This requires an additional connection from 8601A Sweep output to 8412B Sweep input. over a full fast 110MHz sweep. 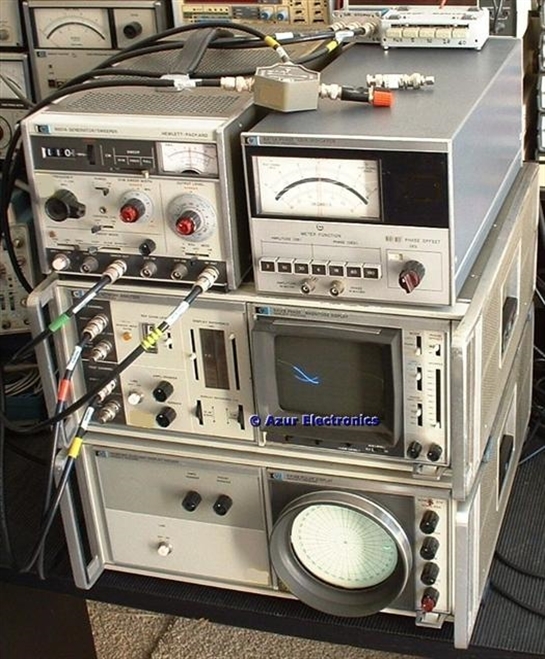 Comparative amplitude and phase measurements are made as for the 8413A, except that the calibration is normally made with the trace adjusted to the centre screen graticule. The change after connecting the DUT can be measured by the vertical displacement. The amplitude can be adjusted from 10dB/Div, down through 2.5dB/Div, 1dB/Div & 0.25dB/Div. Phase can be adjusted from 90°/Div down through 45°/Div, 10°/Div & 1°/Div. Phase offset is also available in 20° steps from 0° to ±180°. This is a bit tricky to set up properly and some practice is required! The Aux RF output of the 8601A can be used to drive a Frequency Counter and in Manual Sweep Mode the horizontal display can be calibrated. For instance, the frequency of a phase change transition can be measured. The Operating and Service Manual for the 8412B explains how to make: swept frequency transmission measurements; and swept frequency reflection measurements. The 8412B is intended for swept frequency measurements with a fast sweep speed. The 8414A Polar Display also displays magnitude and phase information but in polar form. 5. Press and hold the BEAM CTR push-button and adjust HORIZ POS & VERT POS to position the dot in the centre of the graticule. 6. Without the DUT in circuit and with equal cable lengths to the REF and TEST inputs. 7. Adjust the DISPLAY REFERENCE attenuators, AMPL VERNIER & PHASE VERNIER to position the dot or cluster for a reference indication of r = 1/0°. This is placing the dot at the outer circle on the 0° radial line. The DUT can now be inserted in the TEST channel. This calibrates the system for a reflection coefficient of 1.0 at the outer circle. If the DUT has an impedance of 50Ω at all frequencies in the range being swept, the display of its complex reflection coefficient is a dot at the centre of the graticule. If not, the display of the complex reflection coefficient is an irregular pattern which represents at each point: a specific frequency; the reflection coefficient magnitude; and the phase angle. The frequency can be determined by a Counter with the 8601A in Manual Sweep Mode or by frequency markers. The magnitude of the reflection coefficient can be read on the concentric circles with zero at the centre, then 0.2/circle with 1.0 at the outer circle. Changing the DISPLAY REFERENCE gain will change the calibration. Adding 14dB gives outer circle calibration of 0.2 and adding 20dB gives 0.1 calibration. The phase angle (between the incident voltage and the reflected voltage at the plane of measurement) can be read directly in degrees by drawing a radiall line between the centre, the point of interest and the outer circle. 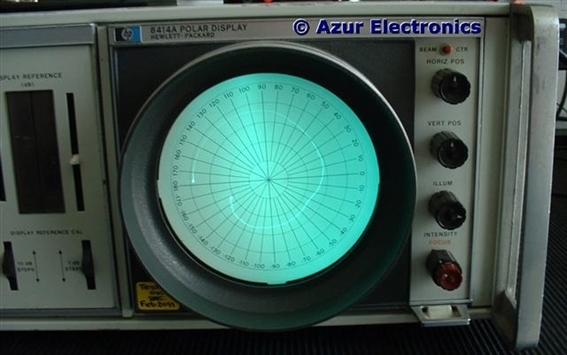 This is a complex subject and more information is provided in the Manual, along with polar display of return loss; polar display of transmission measurements; scattering parameters (S-Parameters); polar display of normalised impedance and admittance; and alternative Smith Charts. The HP 8418A Auxiliary Display Holder provides the opportunity for 2 Display Units to be viewed at the same time. This is very useful to verify the measurements of the DUT and to see the sometimes complex effect of making adjustments in the DUT circuit. It would be more convenient to have this System on a mobile trolley or side table, rather than on the bench, as access is required to the rear panels for cabling. Finally, I would like to acquire the 11652A Transmission/Reflection Kit which contains: the Power Splitter 11652-60009; the 8721A Directional Bridge; 1250-0929 BNC Short; 11652-60001 Precision BNC 50Ω Terminations; 3 BNC Cable Assemblies 11652-0002,3,4; and 2 other BNC Adaptors. Please Contact Me if you have one for sale. 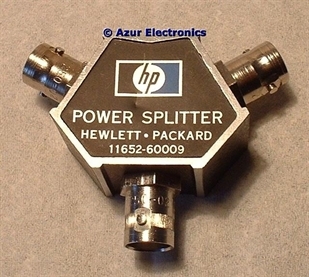 Have bought a HP 11652-60009 Power Splitter but would still like to obtain the complete 11652A Transmission/Reflection Kit. This will be used in place of the Mini-Circuits Power Splitter. There are various tutorials available on the Web describing these measurements.